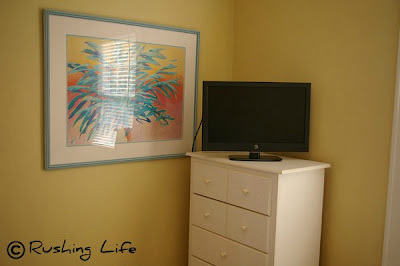 The biggest necessity in a nursery, besides the baby, is the crib. And even though we're about 3 months ahead of schedule, Puff was in a furniture-assembling mood recently, so I just rolled with it! And I totally rocked one of Puff's old t-shirts that read "Green Shirts are for Pimps" on it. Because we're nothing if not classy when doing stuff for Bimmer. There were lots of silent moments of perplexed thinking during the assembly process, but in reality, it only took us about 45 minutes to put the entire thing together. And no fights! 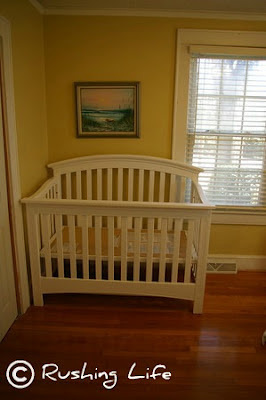 Unfortunately, the crib can't stay where it is shown in this picture, due to the window. Can't give Bimmer reachable access to those cords on the blinds. But for now? Well, it's going to stay right there until we have all the other furniture in place. I do have to give a shout-out to my mom with regards to the crib. 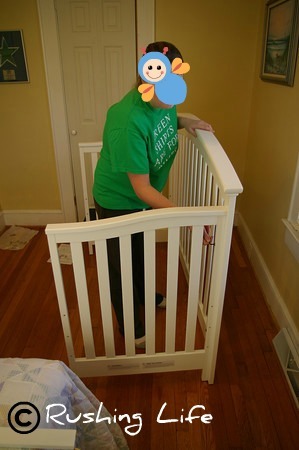 Thanks to a generous donation from her, a coupon, and some stockpiled gift cards, we ended up only paying $43 out of pocket for the crib. Which made that higher-than-anticipated pricetag of the of-course-we-like-a-higher-end-crib a little easier to swallow.